How to use : Figurenet Co.,Ltd. Figurenet is known as the “Parts Rescue” in cyberspace. We specialize in providing customers access to ‘difficult-to-find’ electronic parts and components. We will do our best to find electronic parts and components quickly. We also provide RFQ (Request for Quotation) free of charge. We can also help you sell your excess inventory. For FREE OF CHARGE, we can put your inventory information on the global market. It is a non-hassle way of maximizing your assets. If you have any questions, our sales staff will be happy to help you. Our telephone number is +81-45-440-5545. At the top of our homepage you will find a "SEARCH" button that searches a database of electronic parts and components compiled from sources all over the world. 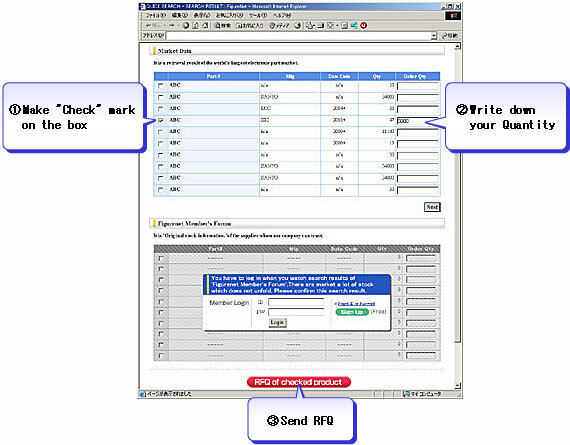 Simply enter the part number (or the first few characters thereof) and click ‘Search’ to list all corresponding matches. We will offer search results from the following two search engines. results are parts available from venders around the world. This database consists of information from thousands of distributors and brokers, and contains upwards of 10 million items. It makes your search for ‘difficult-to-find’ parts easier. By searching data through Figurenet, Figurenet can help select a reliable supplier from among the listed venders, and gather relevant information. We can save your time, money, and effort when searching for this information. Furthermore, Figurenet can help you minimize the risk of purchasing fake and defected items. results are results from our original inventory data. This database mainly consists of stock in Japan, and some of which are not available in the open market. Please register in order to see search results. If you cannot find any search results, try sending us your RFQ. As your “Parts Rescue” Agent, we can help you locate your desired parts. 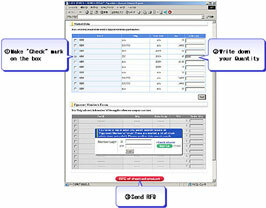 You can send us your inquiry through the Web System, according to the following procedure. Please check the BOX, on the left side of line. Please press the "SEND RFQ" buttom at the bottom of the sheet. Please write down your additional requirement, if you have. Your search results may display several entries for a particular part. This is because the part is potentially available from multiple suppliers. In this case, please check only one of the boxes listed. Figurenet will contact all listed suppliers on your behalf to build your quotation. As mentioned you may submit an RFQ via the website, or alternatively by email (contact@figurenet.com) or fax (81-45-461-1577). We will make every effort to reply as soon as possible, normally within a few days. Remember not to be discouraged even if your search does not yield the parts you are looking for. We are experts in locating parts, and will use all our avenues to help you locate them. We are your “Parts Rescue” Agent. To better understand our “Parts Rescue” service, please check our Flow Chart. Please direct any questions to (contact@figurenet.com) or telephone (+81-45-440-5545).